Q-Mark Electric hydronic baseboard heater with a voltage rating of 120-Volts AC, current rating of 8.3-Amps is power rated at 1000-Watts. It heater in Navajo white color, has steel construction for added strength and durability. This heater with large element reservoir enhances volume of heat storage fluid for prolonged thermal heat of a heater. The heater with 125-Sq-ft heating area has trim and 3-Inch thick functional design with low operating temperatures that ensures installation around the baseboard. 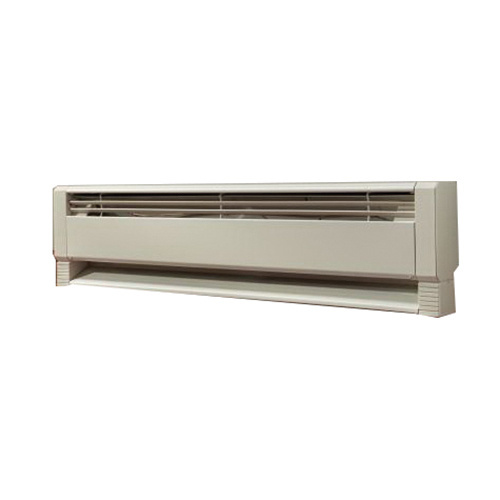 Heater with heavy duty welded steel louvered grilles prevents foreign particle insertion. It has an in-built cut off to turn OFF the heater if over heating occurs. It is suitable for bedrooms, living/family rooms, kitchens, bathrooms, basements, offices, conference rooms, hallways, lobbies, waiting rooms, day cares and geriatric facilities applications. Electric hydronic baseboard heater is cULus listed.